Since there are no intelligent people considering voting for Barry, those folks do not have to be attracted to the John McCain camp, they kinda are lingering around anyway. Of course, they are attracted to the food somewhat, the other restaurant got tagged for multiple health department violations, but there is a guy with a blood-covered tatter of gauze around his hand in front of them at the McCain buffet. They are definitely wary of the potential for illness and only pick up the spoon that he doesn't use. The problem John McCain has is that the morons in the media have turned on him since the Changapotamus joined the fracas. He has to get those folks back on his side. Do understand that McCain is the only Republican in my lifetime to be the darling of the media and it has only been because he runs from the platform of his chosen political party. The media HATED Ronald Reagan, the Lone Ranger that saved the world! Oooooo, John McCain is an "insurgent." With this knowledge and the proper use of the word, the Old Guard Media has to immediately commence their instantaneous nocturnal emissions and drooling. This plan HAS to be successful in at least one way, either the Old Guard has to start calling Muslims "terrorists" or they have to fall in love with McCain all over again. It's a win-win folks. I like those odds. 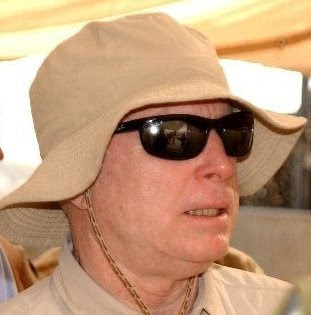 Vote McCain, the Insurgent '08! Oh, I heard on the radio this morning that the late night Uncomedians have told over 15,000 jokes regarding John McCain's age. Think they need new joke writers? I thought that we were supposed to show respect for our elders, you know, because I have damn manners. How tasteless, but even more telling is that there have only been 16 jokes about Barry, WTF!! !, nine of which painted him in a positive light. But, I am almost willing to vote for Barry based solely on this information. Ridding the planet of Jay Leno is my ultimate mission in life.